In my most recent Mother Earth News, I read an article by Kirsten Shockey, author of the book Fiery Ferments. 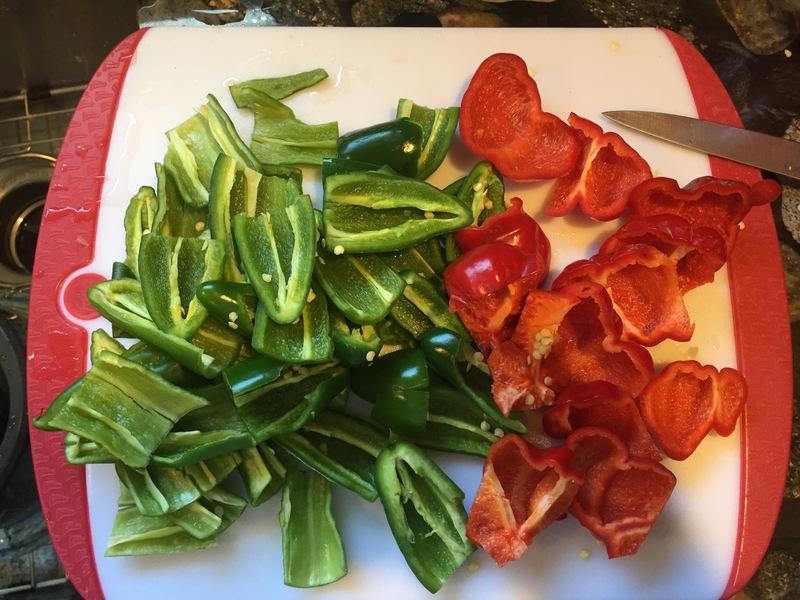 It was about how to ferment peppers in various mixes for later use in recipes. 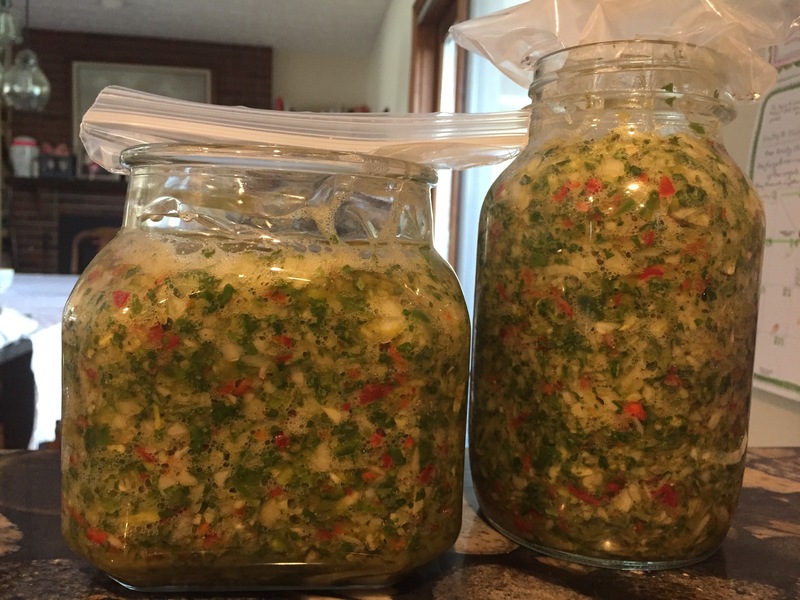 The author made the point that you can only eat so many pickled peppers (I know how that is!) but if you can preserve your peppers as a starter for something else, they’re a lot more versatile. I was intrigued so I decided to try the one I thought we’d use the most and luckily, also the one I had all the ingredients for: Pico de Gallo Salsa Starter. 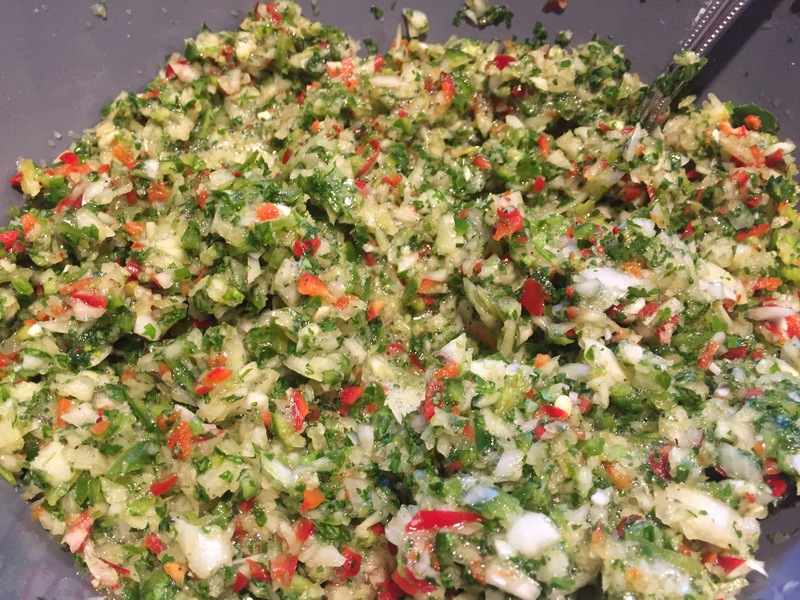 Shockey suggests that this can be used as the base for a salsa with chopped tomatoes or watermelon (1/2 cup starter to 3 cups fruit) or added to avocados to make guacamole. Her recipe calls for 1 poblano and 10 jalapenos, or a combination of chilies. 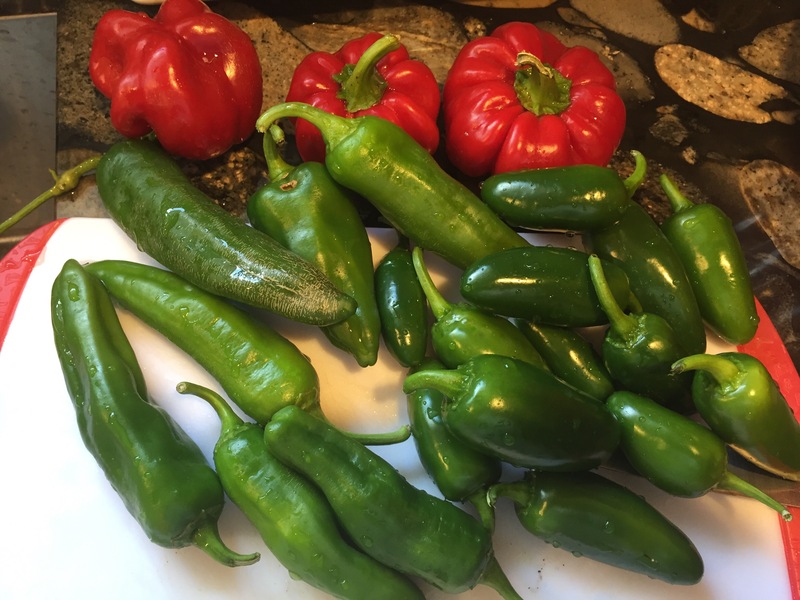 I didn’t grow poblanos this year but I have a medium hot pepper called a Ralph Thompson Squash (the red ones in the picture). I wanted to double the recipe and my R.T. Squash are smaller than a poblano so I used 3. Then I used half jalapenos and half Georgia Flame for the chilies. She didn’t specify if you should remove seeds or not but I didn’t want the heat to be overwhelming so I took them out. Remember to wear your gloves or you’ll be hating life after you handle all these peppers! Even just breathing the fumes while cutting them, I could feel the inside of my nose burning a little. I put the peppers in my food processor and pulsed quickly, just enough to dice the peppers but not puree them. Then I put them in a bowl so I could do the rest of the ingredients (for a doubled recipe): 4 onions, 2 bunches of cilantro, 12-16 cloves of garlic. Is that not the biggest garlic clove you’ve ever seen??? I grew that! This is what it looked like when I mixed it all together. Lastly, I zested and juiced 4 limes and stirred that in, along with a tablespoon of salt and a teaspoon of pepper. 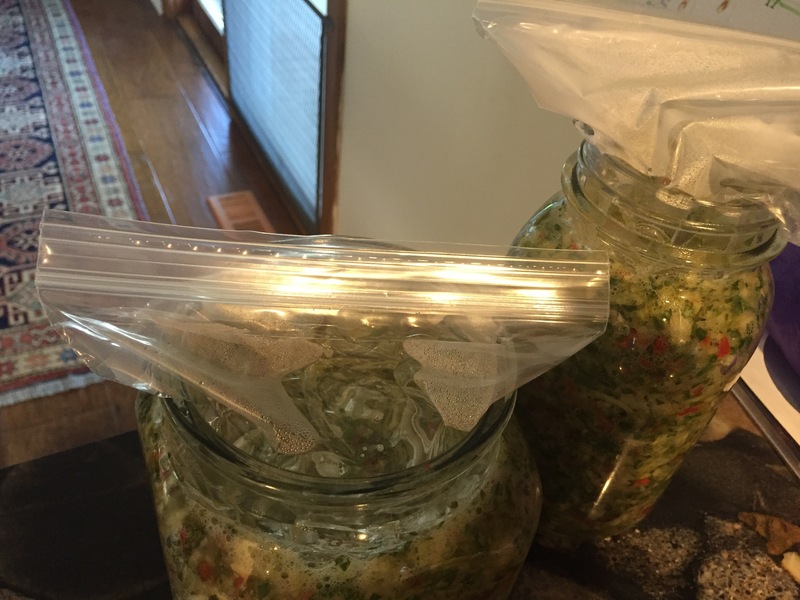 Once it was all mixed, I packed it into two jars, pushing as much air out as I could. See the bags on top? Shockey said to push a bag into the jar so it’s touching the entire surface of peppers, fill it with water, and then seal it shut. I think the function of this is to keep the pepper mix submerged under the liquid. It reminded me of when I did my crock pickles and how I had to put a plate on top and weigh it down with a jar of water to keep the cucumbers submerged. So now I wait. It’s supposed to ferment for 7-14 days and when it’s done (colors are less intense and has a pickle-y smell) the bag comes out. She says to cut a round piece of parchment paper to rest inside the jar, directly on top of the mixture then screw on a lid and store in the fridge for up to a year. I’m excited to try my first batch of salsa or guacamole! This seems like it will be a good way to preserve some of the many many peppers I’m getting. I might have to check out the rest of the books as well. Seems like it could be a good addition to the kitchen library. Do any of you have it already? What’s your favorite recipe?